Contact: +44 (0)1473 642022, or email. You can find the mail centre on the lower loading bay. You can find the restaurant in the Hub. You can find the coffee shop in the Hub. Books, stationery, magazines and much more, located in the Hub. For all your hairdressing and barbering needs, located in the Hub. Call 07745 586433 for an appointment, or check the appointment book outside the salon. A Barclays ATM is located in the main concourse of the Hub. You'll find the cafe in the upper loading bay entrance to the Orion building. The BT Fleet Solutions garage is located in building B42, next to car park D.
It's open to both Adastral employees and the general public, weekdays between 08:00 - 17:00 and by prior arrangement only on Saturdays. To find out more about how we can help you keep your vehicle on the road call 01473 641434 or email ipswich.fleetsolutions@bt.com. Please note that Adastral employees receive a discount on all garage services. AtLAS is the organisation for all leisure and sports at Adastral Park: everything from the Golf Society, BodyTalk Gym, Netball Club and lots more. You and your family can become a member of AtLAS if you work for (or are retired from) any of the companies based at Adastral Park. Visit the AtLAS website for more information. The AtLAS Bodytalk Gym welcomes everyone who works at the park and their friends and family. It has a vast range of equipment with qualified instructors on hand to help with anything from moderate exercise to achieving the peak of physical fitness – and all at very attractive membership rates. For more including how to join, check out the BodyTalk Gym website. You can find the gym adjacent to the upper loading bay of the Aquarius Building. The BT Library collection includes books on technology, computing, certification, management and personal development, plus several language courses on CD/DVD. The Library also has a selection of magazines and journals which can be borrowed. You can also browse a massive collection of online resources, including journal articles, eBooks and conference papers. Contact: +44 (0)1473 648212, or via email. You can find the BT Library on the first floor of the Antares Building. Chargemaster Electric Vehicle (EV) charge points are located in car park E, next to the Hub (see park map). Additional charging points shown near B56 are for electric bicycle recharging only. Find out more about using the Chargemaster EV charging points on Chargemaster's Polar website. Charge points should only be used in accordance with vehicle manufacturers' guidance, using correct undamaged cables. Vehicles should be parked safely, fully within the bay, and cables should not pass across walkways, vehicle routes, or other bays. Charge point users should vacate the charging bay as soon as their vehicle is sufficiently charged. 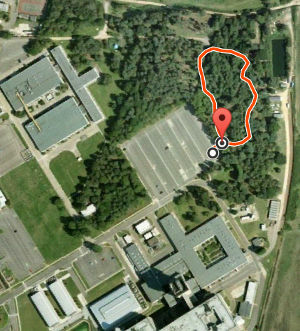 The 0.2-mile circular trail starts from the corner of car park B (top right corner of site map). The route is sign-posted and signage provides a map and more information about what can be seen. The route has minor gradients and is uneven because of tree roots, so is not accessible to wheelchair users. Imagery © 2018 Google, Map data © 2018 Google. Depending on the time of year, expect to see a range of flora and fauna: from small copper, painted lady and peacock butterflies to woodpeckers, song thrush and maybe even a kestrel. The woodland comprises a variety of tree species including birch, sweet chestnut, oak and Scots pine. All accidents must be reported by calling 0800 671345. The park has its own urgent care, the Adastral Park Emergency Services (APES) rapid response team.